Natural grassland is an ecosystem in which the dominant species are perennial grasses, there are few or no shrubs and trees are absent or few in numbers. Grasslands are known by many names, such as the Prairies in North America, the Pampas in South America, Steppes in Central Eurasia and the Savannas in Africa. Grasslands are found where there is not enough regular rainfall to support the growth of a forest, but not so little rainfall as to form a desert. In fact, most grasslands are located between forests and deserts. About one quarter of the Earth's land is covered with grasslands, but many of these lands have been turned into farms. Grasslands are generally open and fairly flat, and they exist on every continent except Antarctica. Most lie in the drier portions of a continent's interior. Grasses are one of the most important natural resources for human beings. A large component of the food we eat consists of grasses such as corn, wheat, oats, rye, barley, rice and sugarcane. Although the primary importance of grasslands is provision of sustenance, grasses also serve humanity in other ways. Grass may be used for building homes and furniture (walls, thatch, matting, brooms), lawns, sports fields and as components of some cosmetics and medicines. Grasslands provide crucial grazing land and pastures for domestic and migrated livestock. The milking capacity and overall health of the cattle is an indicator of grassland quality (Grassland Chapter 2009). Grasslands occupy nearly 30 million sq km or 23 per cent of the earth’s land surface (FAO 1978) and are mainly distributed in areas of low and erratic rainfall which support nearly 30-43 million pastoralists, dependent on livestock and grasslands for their livelihood and are seldom used for growing crops, production of fuel wood, recreation and tourism. In India, grasslands constitute about 5, 48,850 sq km or 16.6 per cent of India’s geographical area; these include arid and semi-arid grasslands occurring in eastern Rajasthan, Gujarat, Western Madhya Pradesh and parts of Uttar Pradesh, Haryana, Punjab and Southern parts of Jammu and Kashmir. In Gujarat, the total geographical area is 1, 96,024 sq km, of which the grasslands extend to 8,490 sq km (4.33 per cent). These are spread across eight districts of the state with the majority of them (41.23 per cent) being in Kachchh district (SAC 2001). They form an important ecosystem in Gujarat supporting a diverse array of wild floral and faunal species including certain threatened species. They also provide fodder for a large population of livestock. Whyte (1957) has classified Indian grasslands into eight types but Champion and Seth (1968) recognized only three broad categories. Later, the Indian Council of Agricultural Research (ICAR) has classified the grass cover of India into five major types (Dabadhghao and Shankarnarayanan 1973). On the whole the grasslands in Kachchh mainland extend to 5,07,732.29 ha, which was 24.05 per cent of the various land uses identified. In Kachchh, three types of grasslands were identified: the most dominant type was Open Grasslands, which also included grass with sparse to very sparse Prosposis juliflora, spreading over 3,85,259.98 ha, forming 75.88 per cent of the total grasslands; the second dominant category was the Grass under Tree extending to 65,632.69 ha, which formed 12.93 per cent; and the third category identified was the Good Grass with an area of 56,839.62 ha, which formed only 11.19 per cent of the total grassland of Kachchh. Other than the Banni and Naliya grasslands, there are three types of grassland: Type One comprises of the grasslands on the hilly undulating area of Bhuj, Mandvi, Anjar and Mundra, spread over an area of 4,73,284.80 ha, which is 20.5 per cent of the total area of Kachchh mainland; Type Two includes the grasslands on the hilly undulating areas of Bhachau and Rapar occupying 4,35,427 ha (22.3 per cent) of the total area of Kachchh mainland; while the third important region includes the grasslands of the coastal areas of Lakhpat, Abdasa, Mandvi, Mundra, Anjar and Bhachau talukas, spreading over an area of 4,10,303.70 ha, and forming 15.46 per cent of the total area of Kachchh (Grassland Chapter 2009). The total grass cover in Saurashtra and Kachchh is 14.93 per cent. Bhavnagar district has the maximum grass cover with 24.02 per cent of its area under grass, while Surendranagar has the lowest grass cover at 6.69 per cent. For instance, in Saurashtra and Kachchh there are 137 reserved vidis (local term for grasslands) covering a total area of 63,292 ha. The reserved vidis are managed by the Forest Department while the non-reserved vidis are given to various agencies for protection, e.g., Gaushalas and panjrapoles (trusts that maintain aged cattle), Maldhariscooperative societies, village panchayats and milk cooperatives. There are 471 non-reserved vidis in Saurashtra and Kachchh, covering an area of 57,602 ha. While the condition of reserved vidis is generally good (e.g., the Rampura grasslands in Dahod), the non-reserved vidis are in terrible condition due to mismanagement, corruption and neglect (Grassland Chapter 2009). Banni, the largest and finest stretch of grassland in India (2617 sq km) and the second largest in Asia, is located on the northern border of Bhuj taluka of Kachchh district at the westernmost end of Gujarat State (GUIDE 2011). The word ‘Banni’ is derived from ‘Bannai’ from the Kachchhi language, which translates to ‘Banni hui’ or ‘made up’, signifying the land has been formed by detritus. The local Sindhi community called the Banni grasslands Peera jo paat or the ‘land of the saints’. Banni grassland—once referred to as Asia’s finest grassland—accounts for approximately 45 per cent of the permanent pastures and 10 per cent of the grazing ground available in the state of Gujarat (Parikh and Reddy 1997). Banni also has a fascinating diversity of flora and fauna, highly nutritive and drought-adapted grasses, a rich cultural heritage, distinguished embroidery and other handicrafts, traditional folk and Sufi music, earthquake-resistant mud houses, long-established fresh-water harvesting techniques (virda), knowledge of medicinal plants as well as animal breeding, and last but not the least, drought-tolerant, highly productive livestock, which is the very basis of survival for the Maldharies. Banni is a dynamic region, not only ecologically but also socio-economically. Altogether, 13 different communities inhabit the area, residing in 48 villages and a vast majority of them are followers of Islam. It was reported that there are 6,287 families, out of which 3,492 families (56 per cent) fall below the poverty line. The Banni supports a total population of 16,783 people and 57,073 livestock (Dave and Dholakia 2010), which is over three times the human population. Agriculture is practically impossible in Banni since it is ecologically not viable. The groundwater table is very low and excessively saline. The soil too is highly saline and the arid climatic conditions do not sustain agriculture. Periodic droughts and low, erratic rainfall makes for even more inconducive conditions. The region is believed to have been formed due to seismic activities and marine processes operating in the north along with fluvial deposition by the Indus and other rivers during the Vedic period. These virtues of Banni have always attracted scientists, sociologists, naturalists and tourists. Livestock is the mainstay of the inhabitants of Banni, constituting the bulk of their assets. Despite tough survival conditions, Banni buffaloes are the most productive cattle in India and have recently been recognized by the National Bureau of Animal Genetic Resources as the 11th distinct breed of the nation (NBAGR, Haryana). During princely rule, the Maharao of Kachchh declared Banni as a Rakhal (reserve grassland), where only milch cattle were allowed to graze. The grazing regulations, executed through a tax locally known as Panchari, slowly disappeared after Independence and different species of livestock from other parts of the state and neighbouring states gained free entry into the area. In 1955, an area of about 2700 sq km of Banni was designated as ‘Protected Forest’ (PF) and brought under the purview of the Indian Forest Act, 1927, while the ownership remained with the Revenue Department of the Gujarat Government. In spite of its significance, the Banni grassland is facing severe degradation and gradually losing its capacity to sustain human and livestock population. The main reasons for the degradation include increasing soil salinity, invasion of Prosopis juliflora, grazing pressures, water scarcity, desertification and climate change. Being a Common Property Land Resource, the grassland of Banni belongs to all but is the responsibility of none. There is neither a declared grazing policy nor any systematic programme for its development in the state. The dependence of the Maldhari communities and their livestock on Banni makes it imperative that efforts are made to ensure its immediate protection, restoration and the sustainable use of the grassland. It is essential to recognize the ecological, economic and sociological role of the Banni grassland and conserve it for the future generations. During the pre-Independence era as well as up to the 1960s, Banni was a pristine grassland. The introduction of Prosopis juliflora by the Gujarat State Forest Department in the northern fringes of Banni to check the ingression of salinity from the Rann into the Banni and other fertile lands of Kachchh has over time converted the grassland into woodland. In ecology every factor is crucially interlinked with another. Any single cause of change may have multiple effects to the long-term scenario. Hence, the change of the ecological status of a grassland into a woodland may also have implications on the livelihood opportunities of the people living in the region. With the above view, an assessment based on primary and secondary data between the Pre-Independence and Post-Independence period was carried out to understand the very basis of sustenance of the livelihood of the Banni Maldharies. The Gujarat state encompasses an arid area of 62,180 sq km, 73 per cent (45,652 sq km) of which is located in the Kachchh district of the state. The district is poorly endowed in terms of its land quality, as about 23,310 sq km (51 per cent) of the area is covered by saline marshy deserts (Greater and Little Ranns) situated at 230 19’ to 230 52‘ N latitude and 680 56’ to 700 32’ E longitude. The climate of Banni is arid and the temperature varies between 370 C to 450 C in summer with May and June being the hottest months when the temperature can rise to a maximum of 500 C. The winter temperature goes down to 100 C with January and February being the coldest months. The total annual rainfall occurring during the south-west monsoon is very low with an average of 317 mm per year with the coefficient of variation being 65 per cent (GAU 1989). Droughts are a recurring phenomenon. The soil of the Banni is inherently saline and consists of recent alluvium mixed at places with aeolian sandy deposit and the entire area has deep to very deep clayey and coarse textured soils in discontinuous patches. Salinity is highly variable from 1.0 (very low) to over 15.0M mhos/cm and forms 90 per cent of the area under moderate to very high salinity and pH ranges between 6.5 and 8.5. The presence of high silt and clay reduces the vertical and horizontal movement of surface water creating waterlogging problems (GUIDE 1998). Banni is known for its rich wildlife and biodiversity. About 150 species of migratory and resident birds are found here along with a rich diversity of herpetofauna and other invertebrates. The wild animals include the Blue bull (Boselaphus tragocamelus), Chinkara (Gazella bennettii), Black buck (Antilope cervicapra), Black-naped hare (Lepus nigricollis), Wild boar (Sus scrofa), Jackal (Canis aureus), Grey wolf (Canis lupus), Caracal (Caracal caracal), Hyena (Hyaena hyaena), Bengal Fox (Vulpes vulpes) and Jungle cat (Felis chaus) (Vijayakumar et al. 2008). All of these species are legally protected under the Indian Wildlife (Protection) Act, 1972. Though the Banni grassland was declared as a Protected Forest more than half a century ago, Gujarat state's forest department has only recently proposed a special plan to restore and manage this ecosystem in a more efficient way. The region is covered with coarse and low perennial grasses like Desmostachya bipinnata (Dhrab), Sporobolus marginatus (Dhrabad), Dicanthium annulatum (Jinjvo), Cenchrus ciliaris (Dhaman), Sporobolus fertilis (Khevai), and Chloris barbata (Siyarpuchha), as well as sparsely distributed colonies of Cynodon dactylon (Chhabar), Dactyloctenium sindicum (Madhanu), Eleusine compressa (Nanu Mandhanu); besides sedge like Eleocharis atropurpurea (Nano chiyo), Cyperus rotundus (Chiyo), Cyperus alopecuroides (Kaluro) and coarse and pioneer colonizing grasses like Aleuropus lagopoides (Khariyu) and Cressa critica (Oin; according to the Maldharies, this herb species increases the milk productivity of buffaloes) occur extensively. Shrubs like Suaeda fruticosa (Lano) and Tamarix aphylla (Lai) occur abundantly all over especially in places where waterlogging occurs in pools during the rainy season and sedges occur with annual grasses around the fringes (Joshi et al. 2009). As mentioned earlier, Banni consists of 48 villages, regulated under 19 Panchayats (local governer’s body) under the State administration. The land use system of Banni is classified into five major types: grassland or grazing land, cultivated encroachment area, settlement or village area, wetland and saline land. Maldharis are cattle breeders and are generally identified as being well-built with tall physiques. They are usually seen with long wooden sticks and a water pot hanging from their shoulders, moving with a herd of sheep, goat, camels or cattle. Varying estimates put their population at anywhere between 25 to 40 lakh. The traditional pastoral castes include Rabari, Bharwad, Charan, Jat, Mutva and others. Historically, they have been skilled livestock breeders or herders who have evolved indigenous ways of using the scarce resources of the largely uncultivable arid and semi-arid lands of Saurashtra, Kutch and North Gujarat (Mahajan et al. 2006). People and Livestock: Livestock being the mainstay of the Banni inhabitants, the grassland tract is widely identified as a major cattle-breeding tract of Gujarat. About 22.31 per cent of the human population in Banni is directly involved in livestock rearing and allied activities (Census 1991). Pastoralists of Banni now supply 60,000 litres of milk per day produced by their animals. Being raised in an extensive system, the milk is pure and has the potential to to be recognized as natural milk and is supplied as such to Bhuj city. The pastoral community of the Banni region contributes around Rs. 32 crores a year to the milk economy. In addition to this, the community produces good quality ghee (clarified butter) and mava (condensed milk) for their own consumption and sometimes for sale. Major land use changes introduced in the colonial and post-colonial periods led to a gross reduction in traditional grazing resources. Most animal husbandry schemes in the post-Independence era promoted the Amul pattern of dairy development, which is linked to sedentary livestock-keeping and assured milk supplies. Therefore, Amul has flourished in historically non-pastoral, non-arid and well-irrigated regions of Gujarat. However, in Banni today, the nomadic pastoralists' search for fodder and water has become an unending process. The nomadic pastoralism in Banni is a major reason for the failure of the White Revolution in this area. Even while some of them managed to move to urban centres or explore alternative livelihood options, many more have been forced to undertake long migrations or become casual labourers. Drought: It is one of the important natural factors responsible for the degradation of the Banni grassland. It is also important to note that severe consecutive droughts, which were very rare during the early and middle part of the 20th century, occurring only twice (1904-1905 and 1968-1969) between 1901 to 1980, a span of 80 years. The following decades (1981–96) saw the intensity as well as duration of severe droughts increase abruptly. Three consecutive severe droughts occurred from 1985 to 1987 and another two consecutive droughts from 1995 to 1996. This situation predominantly affected the soil moisture and led to grassland degradation (GUIDE 1998). Salinity: Banni suffers from a problem of inherent salinity. During the early days the rivers, which were flowing from the Kachchh mainland to Banni, were not only depositing the detritus and maintaining the soil moisture, but also leached the salinity of the area during good rainfall years. A multitude of factors, viz. the damming of rivers, construction of roads along the border with Pakistan in the early 1960s, and salinity ingression from the Rann into Banni are responsible for aggravating the problem. Hence, the soil is suitable for salt-tolerant species only. Overgrazing: Grazing is good and suitable for any rangeland to increase its productivity but overgrazing is harmful and often suicidal for any land. During the normal rainfall years, livestock from neighboring talukas and districts of Kachchh and even from other states migrate into Banni for grazing. Overgrazing by native as well as migrant livestock is another major problem in Banni. The pre-Independence era saw a move to restrict grazing options in Banni when the then Maharao declared Banni, with its area of 2,144 sq km, as a reserve grassland (Rakhal), where only grazing by mulching cattle and buffalo was permitted, while sheep and goats were strictly prohibited. This prevented overgrazing. However, the scenario started changing after Independence when flexible government regulations paved the way for a pastoral mode of life away from nomadism, the direct effect of which was felt by the Banni. Prosopis invasion: Banni was known for its grass and was recognized as the best grassland of Asia. Introduction of P. juliflora to stop desertification in the initial years and lack of proper silvicultural practices led to the spread of this species as a weed. Interaction with the locals and literature reviews revealed that Banni was once dominated by Acacia nilotica but exploitation of the species for timber and fuel wood coupled with the spread of P. juliflora led to its disappearance from most of Banni. Following the non-availability of Acacia in the wild, locals started using P. juliflora as fuel wood. Repeated cutting resulted in thickets of P. juliflora due to its coppicing nature. Seeds would spread with the dung of livestock which fed on the pods of tree, and invaded low saline areas of Banni. The construction of a dam and reduction of fresh water inflow acted as a catalyst for the spread of P. juliflora. This resulted in the invasion of P. juliflora in good soil. The Gujarat State Forest Department had initially planted about 31,550 ha exclusively of Prosopis juliflora as a measure to check the advancement of the Rann in the year 1960-61. The circumstances of the Banni, such as successive droughts, increasing salinity and less palatability provided suitable conditions for the growth and extension of the hardy Prosopis juliflora, which is today a dominant species of vegetation in Banni. As per the Indian Space Research Organization’s estimate it is spreading at the rate of about 25 sq km per year. Prosopis posed a natural threat to the endemic flora and fauna due to its high invasive abilities. Prosopis pods are detrimental to cows. Over the years, the livestock dynamics changed along with livestock preferences, where robust cows gave way to sturdier buffaloes. The yearly rate of expansion of P. juliflora in Banni grassland is about 4488 ha/year (Jadhav et al.1998), and it is expected that the weed would take over 56.42 per cent of Banni by 2020 (Sastry et al. 2003). Impact of the degradation of Banni: The crucial interplay of the above said factors played a pivotal role in decreasing the sustainability of the Banni and declining human population trends. The human population of Banni has decreased from 14,389 in 1981 to 10,949 in 1991 (24 per cent) and livestock population has declined from 49,240 in 1982 to 26,084 in 1992 (47 per cent). Among the three regions of Banni the census record between 1981 to 1991 highlights that in western Banni the human population decreased from 6,809 to 4,149 and livestock from 20,718 to 7,333. In central Banni human and livestock population decreased from 6,699 to 6,028 and 24,117 to 16,462 respectively, whereas in the eastern part the decrease was from 881 to 772 and 3,279 to 1451 respectively. From these figures it is evident that eastern Banni has already lost its capacity to sustain human as well as livestock population and the western part of Banni too is slowly losing its capacity. As a result, a maximum concentration of 55 per cent of the human and 65 per cent of the livestock population is centered in the central Banni region, creating excessive pressure on this area (GUIDE 2004). However, the emphasis of the locals has shifted to selling animal products such as milk and ghee, which has resulted in a sudden influx of livestock into the area. As a result of deteriorating grassland potentiality, driven by a series of natural and anthropogenic drivers of change, many pastoralists, especially from the younger generation, have left their villages seeing no hope for their future in this occupation. This is a very common phenomenon throughout the district (Mahajan et al. 2006). Respondent’s information: Of the 56 respondents, 50 were Muslims and only six were Hindus; the majority (30.77 per cent) belonged to the tribal Muslim Jat community residing across eight villages. The age group ranged from 35 to 92 years, with the average age being 64, and most respondents had lived around the animal herds all these years. All the respondents, except for the eldest one, frequently visited most parts of Banni during the dry season, for free grazing of their animals. In addition, most of the respondents had fairly good knowledge of the grazing routes in each season, with a traditional understanding of the availability and quantity of fodder species on particular grazing routes. Grassland Degradation: In general the degradation of grasslands takes place due to droughts, invasion of exotic species, expansion of salinity, overgrazing, encroachment of grasslands for agriculture and industrial development, planting woody species, etc. The effect of these factors causing degradation of the Kachchh grasslands was evaluated based on interviews with residents and also through village level meetings of the stakeholders. Based on the people’s perception it was found that in Kachchh the major factors that cause degradation were invasion of P. juliflora, salinity, overgrazing, agricultural expansion, immigration of cattle, drought and decline in palatable species. Prosopis juliflora invasion: According to stakeholders, Prosopis juliflora is by far the most important reason for the degradation of the Kachchh grasslands as is evident from the table below. Overall, 90.48 per cent of the respondents had identified the P. juliflora invasion as the major cause of degradation. The region and cluster-wise analysis of the same showed that in Cluster III all the respondents had mentioned P. juliflora as the reason for degradation. This was followed by Region I (97.48 per cent), Cluster II (93.22 per cent), Cluster IV (82.98 per cent) and Cluster I (75.61 per cent). The lowest percentage of response in this category was from Region II (67.60 per cent) (Table 1). Plantation of Woody species: This factor seems to influence the degradation at a moderate level as mentioned by the stakeholders. A total of 30.29 per cent of the respondents attributed this as a reason for degradation. At the region and cluster level, it seems to be a problem in Region II (42.25 per cent), Cluster IV (40.42 per cent), Cluster I (34.15 per cent), Cluster II (33.59 per cent) and Cluster III (29.63 per cent). In Region I, though it was memtioned as one of the reasons for degradation, the percentage was comparatively low (Table 1). These plantations are being undertaken by the Gujarat State Forest Department (GSFD) and Gujarat Energy Development Agency (GEDA) as a form of energy resource developmen, which is usually done in the grasslands, gauchar (grassland for cattle) and other Common Property Land Resources in the villages. According to the village stakeholders, though this is being managed quite well, the benefits do not reach them, which is a cause for concern. They feel that local villagers should be given importance while planning the sharing of benefits. Overgrazing: Grazing if done in a controlled manner is advantageous to the grassland and highly important to maintain the ecosystem. However, in an arid region like Kachchh, due to free access and uncontrolled grazing, it has become one of the main detrimental factors that has led to the degradation of the grassland. In Kachchh, a total of 68.19 per cent of the respondents stated this to be a primary cause. When the regions and clusters as a whole were considered, it was a severe threat in Cluster III (73.15 per cent) and Region I (72.86 per cent) followed by Cluster II (69.49 per cent) and Cluster IV (63.83 per cent). The least percentage of response where the severity level was high was from Region II (56.41 per cent) and Cluster I (56.10 per cent) (Table 1). This clearly emphasizes that overgrazing is one of the main causes for the degradation of the grasslands of Kachchh. Agricultural Expansion: During the village level meetings and field observations, it was found that local villagers have encroached on the grasslands for cultivation in many cases. From the stakeholder consultation and interviews this was given as one of the reasons for degradation or shrinkage of grasslands. Based on the analysis at Kachchh it was evident that the response towards this factor as a reason of degradation was less (22.86 per cent). The actual effect could be still higher as people refrrain from declaring this as illegal. This was mentioned as a major problem in Cluster III (40.42 per cent) followed by Cluster II (35.59 per cent) Region II (35.21 per cent) and Cluster IV (27.66 per cent). In Region I, although there is no agriculture, the response of people (9.04 per cent) was based on encroachment along the fringes of Banni. In Cluster I, the majority of respondents stated this as low (Table 1). This being an illegal activity peoples’ response in this regard might not be true but from the analysis using RS and GIS and land use data from the government records, it is evident that this is a problem vis-à-vis the loss of grasslands. Migration of Livestock: This factor as a reason for grassland degradation goes together with overgrazing and increases the magnitude of the problem. This problem as sensed by the stakeholders needs proper control, with even the imposition of a ban being seen as a solution. On the whole 46.09 per cent of the respondents had attributed this to be of high severity. Among the regions and clusters, Cluster I had maximum respondents stating livestock migration as the main cause (53.66 per cent) followed by Cluster IV (51.06 per cent), Region II (45.08 per cent) and Cluster II (43.07 per cent) and Region I (40.75 per cent). The least response was from Cluster III with only 34.26 per cent respondents stating this as a problem of high severity (Table 1). Drought: Kachchh falling within the arid area faces frequent droughts, which influences the biomass production and leads to a resource crunch. The grasslands (Horn et al. 2003) face decline in productivity and quality due to drought. The perception of the stakeholders clearly showed that drought is one of the main factors that has led to degradation of grasslands in Kachchh. This is apparent from the peoples’ response at Kachchh level 81.34 per cent of the respondents stating that this has influenced degradation of the grasslands. Among the regions and clusters, Cluster III showed 88.89 per cent of respondents stating that drought is the reason for degradation of grasslands followed by Region I (high severity 87.94 per cent), Cluster II (84.75 per cent), Cluster IV (78.73 per cent) and Cluster I (70.73 per cent). Minimum response 56.24 per cent (with high severity) was recorded from Region II (Table 1). It is very crucial to frame proper management strategies, which are essential to reducing the impact of this factor on grass resources and to improve/change the existing fodder crisis scenario. The management of the Banni grassland as a Protected Forest needs to be amended transferring it into a Joint Forest Management (JFM) framework involving pastoral communities and the Forest Department. In principle, this does not involve any change in the legal status as any degraded forest can be brought under the JFM. However, in this case, the policy change needs to move a step ahead and recognize these so-called ‘forests’ as grasslands and designate them as joint management for grassland regeneration instead of forest regeneration. This needs to be accompanied by eradication of woody invaders from at least a small portion every year and controlling re-invasion of the reclaimed area by bringing the reclaimed area under joint management of communities and the Forest Department. The pastoral community’s willingness and interest in grassland regeneration has been demonstrated by the success of small-scale pilot projects in Banni. The household survey data and group discussions also reveal the preference of large sections of the pastoral community for grassland regeneration over incomes from wood-charcoal. These policies can be backed with proper guarantees on usufruct rights for grass resource use from areas reclaimed from woody invasion and the economic exploitation of woodlot resources either as timber or non-timber produce. These are fairly feasible and reasonable propositions without altering the existing land ownership rights and hinge primarily on usufruct rights and institutional mechanisms for managing resources jointly by the government agencies (primarily the Forest Department) and local community. These policy changes for Banni could lead to more efficient use of grasslands, allowing legal economic exploitation of wood lots, and incentives for sustaining sound resource management. In fact, the situation presents a unique opportunity to reclaim the grassland ecosystem while reaping enormous economic benefits. If attempted, this will be an unprecedented experiment with high potential for success. The policy changes could, in effect, assist in the diversification of income as one of the risk aversion strategies for pastoralists. Policies should recognise the opportunities to rejuvenate the local economy in the region through management of the woody invader. The management interventions in Banni have been taken without any proper background studies on the economics and ecological implications. There is a policy need to recognize the role of scientific studies and a ‘systems’ approach in managing the grazing lands. Considering the highly dynamic nature of ‘grassland-woodland’ transitional phases and existence of many non-linear relationships between ecological and economical parameters, the entire Banni management needs a serious scientific review. After a critical analysis of the results of the present study together with the inferences of previous studies, P. juliflora can be considered as one of the most valuable tree species for the dry arid lands where nothing else grows. The tree is not only responsible for increasing vegetation cover but also plays a role in sustenance of livelihood through generation of economic activities, employment, option for fodder to their livestock, raw materials for handicraft, and many more. Prior to the invasion of Prosopis juliflora, people used to sustain themselves only from a Livestock Based Income (LBI), but now there are many livelihood and economic options generated through the P. juliflora and their income has increased manifold from Non-Livestock Based Income (NLBI). To sustain the grassland ecosystem and intangible biodiversity of the Banni region, some special conservation measures and management options are needed. The continued existence of biodiversity and the grassland ecosystem as well as the sustenance of livelihoods needs proper management of both grassland and P. juliflora in the Banni region. Champion, Sir H.G. and Shiam Kishore Seth. 1968. A Revised Survey of the Forest Types of India. New Delhi: Government of India Publications. Dabadghao and Shankarnarayan. 1973. The Grass Cover of India. New Delhi: iCAR. Dave, Sanjay and Utkantha Dholakia, eds. 2010. Banni: Samrudhdh Varsa ni Orakh ane Jatan. Gujarat Institute of Desert Ecology (GUIDE) and Gujarat State Forest Department (GSFD), Kachchh Circle, Bhuj-Kachchh with the support of Gujarat Forest and Environment Department. FAO. 1978. Farm Management Notes for Asia and the Far East 5. Regional Office Bangkok. GAU. 1989. Status Report, Vol. 1. National Agriculture Research Project, North-west Agroclimatic Zone, Gujarat Agricultural University, Sardar Krushinagar. GUIDE. 1998. Ecorestoration of Banni Grassland. First Annual Technical Report by Gujarat Institute of Desert Ecology, Bhuj. GUIDE 2004. 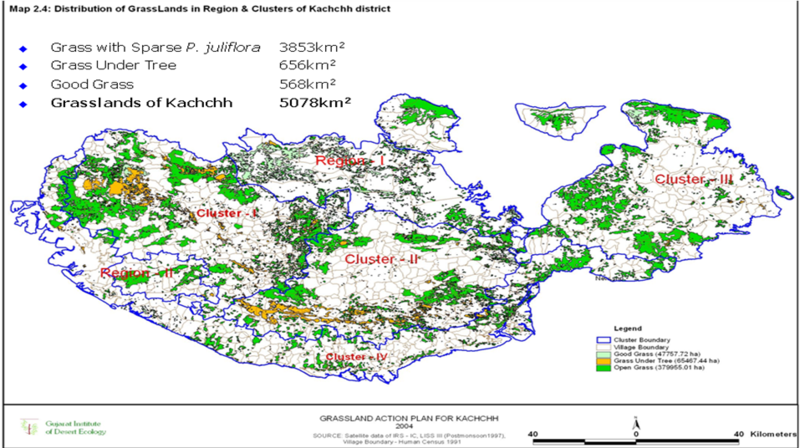 ‘Grassland Action plan for Kachchh district, Gujarat State.’ Final report by Gujarat Institute of Desert Ecology, Bhuj. Grassland Chapter. 2009. Published by Gujarat Ecological Commission, Gandhinagar, Gujarat. Jadhav, R.N., M.M. Kimothi and A.K. Kandya. 1992. ‘An approach for assessment of grassland using satellite remote sensing – A case study for semi arid region (Banni), Gujarat.’ In Proc. Nat. Symp. on Remote sensing for Sustainable development, pp. 37–42. Joshi, P.N., V. Vijay Kumar, K. Mukesh, Yatin Patel and T. Karthik. 2009. ‘Local perceptions of Grassland change and priorities for conservation of natural resources in Banni (Gujarat) India.’ Frontiers of Biology in China, 4.4:549–56. Kumar, V. Vijay, P.S. Patel, N. Gajera. 2011. ‘Grasslands of Kachchh', in State of Environment of Kachchh (SoEK), eds. K. Kathju, V. Vijay Kumar, G.A. Thivakaran, P.S. Patel and V. Devi. Published by Gujarat Institute of Desert Ecology (GUIDE), Bhuj and GEER Foundation, GoG, Gandhinagar. Mahajan, V. and c. Bharadwaja. 2006. ‘Lost and forgotten: Grasslands and pastoralists of Gujarat,’ paper presented in the ‘Proc. of THE FORSAKEN DRYLANDS; a symposium on some of India's most invisible people’ no. 564, pP. 35–39. Parikh, Jyoti K., and B. Sudhakara Reddy, eds. 1997. Sustainable regeneration of degraded lands. New Delhi: Tata McGraw Hill Publishing Company. Pardeshi M., V. Vijay Kumar, N. Gajera and A. Kumar (2008). ‘Hardwick’s spiny-tailed lizard (Uromastyx hardwickii, Gray 1827) preyed on by Indian sand boa (Eryx johnii, Russell 1801),’ Journal of Bombay Natural History Society 105.3:343–44. Reddy, C.V. Konda. 1978. ‘Prosopis juliflora, the Precocious Child of the Plant World,’ Indian Forester 104.1:14–18. SAC. 2001. Grassland mapping in Gujarat using remote sensing and GIS techniques. Space Application Centre (SAC) ISRO, Ahmedabad. Sastry, K.L.N., P.S. Thakker and Ravi Jadhav. 2003. ‘Biodiversity threat through exotic species monitoring and management using remotely sensed data and GIS techniques - A case study of Banni (Kachchh) Gujarat. India,’ paper presented at ‘6th Annual International Conference on MAP INDIA 2003’, New Delhi, 28-31 January 2003. Whyte, Robert Orr. 1957. ‘The grassland and fodder resources of India.’ Indian Council of Agriculture Research, New Delhi.